Hydra (aka OCD181) Class No. 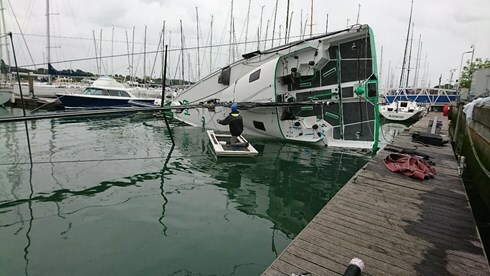 #149 on delivery home to Norway after completing measurement in the UK and finishing second in class shortly afterwards in her first race, the RORC Myth of Malham. For those not used to Class 40 sailing, the team experienced what we call 'easy miles'. Drinking a coffee while the boat sat on the surf at 22 kts for minutes at a time and with a top speed on delivery of 25.9 kts. "Just a quick note to say all went well on the trip. She is a beast ! .....Considering we were in delivery mode and about .5 tonne more gear onboard that we would like the downwind performance was superb. A5 and 1 reef kept the nose out of the steep N sea shop and we had some big numbers and average speeds."